We're still stuck in the Eurovision Song Contest and in the Seventies on this blog. 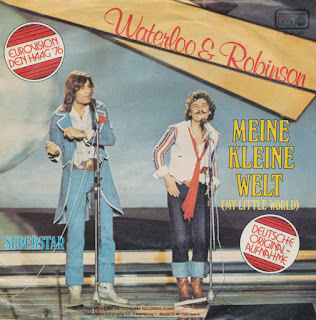 It is usually a pleasure but it becomes a bit of a hard slog when you listen to this 1976 entry from Austria by Waterloo & Robinson. Six years ago I wrote about My little world, which was the English version of this song, 'Meine kleine Welt'. Although the song was performed in English at the Eurovision Song Contest, it was originally written and performed in German for the national finals in Austria. Until 2007 the duo remained together, but then they decided to focus entirely on solo projects. I haven't heard any of their songs except the ones on this single, and that's enough for me, to be honest. Waterloo & Robinson are an Austrian duo, consisting of Johann Kreuzmayr ('Waterloo') and Josef Krassnitzer ('Robinson'). 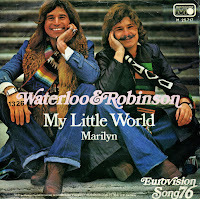 They represented Austria during the 1976 Eurovision Song Contest with 'My little world'. The song was performed entirely in English, which was a first for Austria. The song ended up in fifth place during the Contest, which was won by Brotherhood of Man with 'Save your kisses for me'. Waterloo & Robinson participated in Austria's national finals for Eurovision again in 2004, but did not win.